White-winged choughs (Corcorax melanorhamphos) are obligate cooperative breeders, living in groups which may contain up to 20 birds. Although breeding is dominated by a single pair, all birds contribute to rearing young, including the provisioning of nestlings. However, some birds which have carried food to the nest, even to the point of placing the food in the gaping mouth of a nestling, consume the food themselves rather than provision the nestlings. Birds which fail to feed nestlings are typically young, and are only likely to fail to deliver food when they cannot be observed by other group members. Birds which have just failed to deliver food are more likely to engage in alternative helping behaviours such as allopreening the nestlings than are helpers which have just delivered food in the conventional manner. 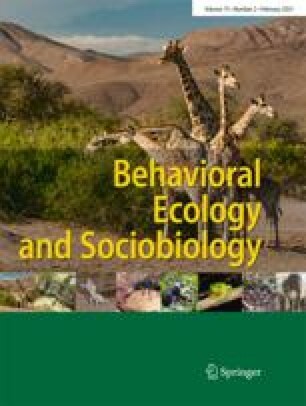 Failure to deliver food is almost eliminated when foraging constraints are experimentally reduced by supplemental feeding of the group. Collectively these observations suggest that young white-winged choughs act deceptively by simulating helping behaviours without sacrificing food supplies.